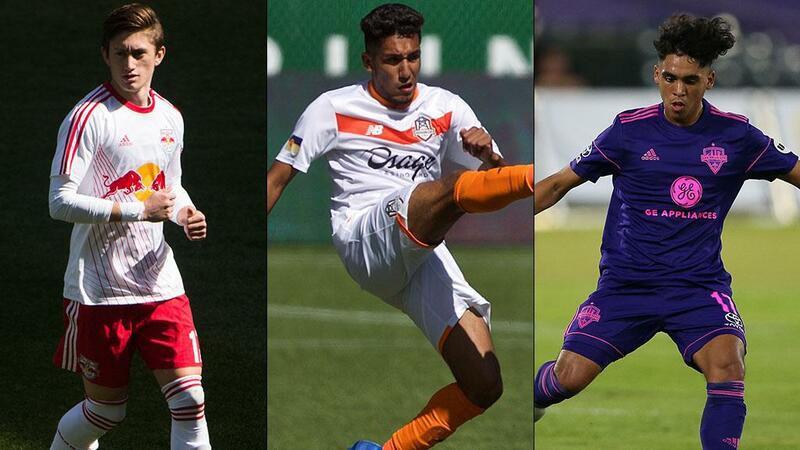 Ben Mines (left), Jesus Ferreira (center) and Jose Carranza (right) are among the current and former USL Championship standouts who will head to Florida this weekend for the first U.S. Men's Youth National Team training camp of the year. CHICAGO – Current and former standouts from across the USL Championship – including eight players who have previously earned selection to the Championship 20 Under 20 – will head to Florida this weekend as the United States Men’s U-20, U-19 and U-17 squads convene for the first training camp of the year at the Premier Sports Campus in Lakewood Ranch, Fla. Among the notable new additions to Head Coach Tab Ramos’ U-20 squad is Jesus Ferreira, who was named the No. 13 player in the 2018 edition of the 20 Under 20 after a strong season on loan with Tulsa Roughnecks FC from FC Dallas. A native of Colombia, and the son of 2010 MLS Most Valuable Player David Ferriera, the young forward recently turned 18 and applied for United States citizenship. Ferreira told FCDallas.com’s Carter Baum he was excited for the opportunity to go to camp, where he’ll be joined by FC Dallas teammates Brandon Servania – who also earned selection to the 2018 20 Under 20 after a positive year on loan with the Roughnecks – and Paxton Pomykal. Another notable name in the U-20 squad is Louisville City FC midfielder Jose Carranza, who joined the USL Cup champion in midseason last year after previously competing for ATL UTD 2 at the start of the season. Also named are Matt Real, Anthony Fontana, Sam Rogers, Ayo Akinola and Jaylin Lindsey, all of whom featured in the Championship a season ago while also helping the United States claim the Concacaf U-20 Championship and a place in this May’s FIFA U-20 World Cup in Poland this past November. New York Red Bulls II forward Ben Mines – who was name as the No. 10 player in the 2018 20 Under 20 – earned his first call-up to the U-19 national team that will be led by former LA Galaxy II Head Coach Curt Onalfo during its time in Florida. He is joined in the squad by Brenden Aaronson, who featured for Bethlehem Steel FC a season ago, and James Sands, who spent time on loan with Louisville City FC from New York City FC. Swope Park Rangers midfielder Gianluca Busio – who was the No. 6 selection in the 2018 20 Under 20 – leads the U-17 group, which also features Reno 1868 FC loanee Gilbert Fuentes and the Seattle Sounders FC 2 duo of Alfonso Ocampo-Chavez and Ray Serrano. Also selected in the U-17s squad is goalkeeper Aaron Cervantes, who last year became the youngest signing in Championship side Orange County SC’s history. The camp marks the starting point of a key year for the Men’s Youth National Teams, with the U-20s beginning preparations for the 2019 FIFA U-20 World Cup in Poland this May and the U-17s looking ahead to the 2019 Concacaf U-17 Championship this spring, where the team will aim to qualify for October’s 2019 FIFA U-17 World Cup in Peru. The camp will feature three games between the U.S. squads and a to-be-determined opponent. All three games at the Premier Sports Campus will be open to the public.